Howard Greenberg Gallery, NY; purchased with donated funds from The Howard Gilman Foundation and The André and Elizabeth Kertész Foundation by NGA, 1996. Building a Collection, National Gallery of Art, Washington, 1997-1998, no. 29. André Kertész, National Gallery of Art, Washington; Los Angeles County Museum of Art, Los Angeles; International Center of Photography, New York, 2005, no. 63. 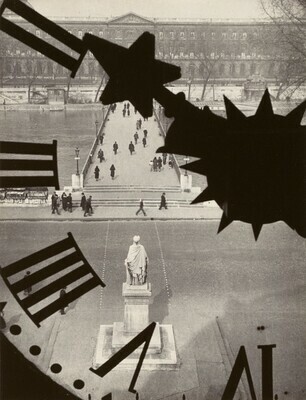 André Kertész: Of Paris and New York. Exh. cat. The Art Institute of Chicago: p. 171. André Kertész: Diary of Light 1912-1985. Millerton, 1986: pl. 53. André Kertész: Ma France. Paris, 1990: p. 187. André Kertész. Millerton, 1993: p. 51. André Kertész: Photographs from The J. Paul Getty Museum. Malibu, 1994: pl. 36. Borhan, Pierre. André Kertész: His Life and Work. Boston, 1994: p. 107.